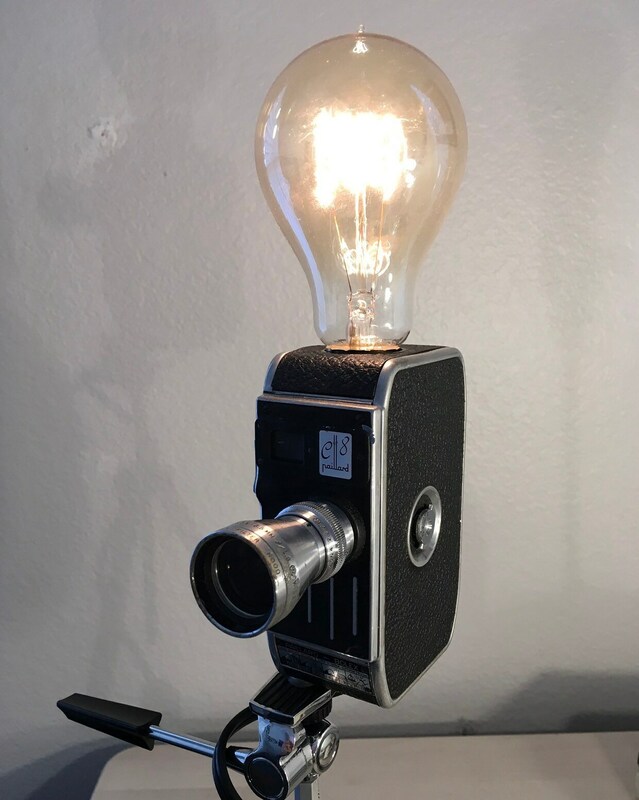 Unique Retro Camera lamp . Vintage Paillard L8 8mm movie camera lamp with tripod . Original gift idea. Great for a photographer. Old world crafts made into cool lamps for now. In the 50's and 60's when the 8mm home movie craze was at it's height most people had cameras made by Kodak, Keystone or Revere. If you had money or taste you would have gone for Paillard Bolex. If you know anything about early photography you will be very familiar with Bolex as an icon of optical excellence. This was the very best of the home movie 8mm market. I felt slightly guilty cutting on a Bolex (a Bolex!) and even if I came by a cheap Hassablad I couldn't make myself cut on one of their cameras...Yet the beauty of this camera should be treasured. Creating a accent lamp from a wonderful old camera gives it a second life. One where it still will be admired. The lens in this camera is still intact and the beauty of form and design shine through in this lamp.